Vera Pasta's fresh ravioli are made with a blend of spices and herbs delicately packed into egg-yolk dough. Our seasonal fillings consist of pumpkin, spinach, shrimp, veal, mushroom and other timely ingredients. 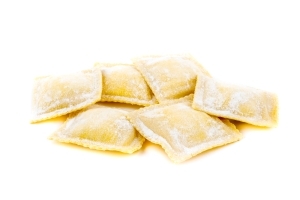 Our ravioli can be purchased (per dozen) at local farmers markets. Please keep in mind that the availability of flavors and types is subject to change from week to week, depending on the seasonality of fresh ingredients. Vera Pasta also supplies wholesale pasta and ravioli to a myriad of clients, including restaurants/hotels, grocery/specialty retail stores, online storefronts, private labels and farmers market venders. If you’re interested in a gourmet pasta partnership, please contact us and we’ll provide you with fresh flavors and types that are currently available. Currently, our fresh pastas can be purchased in Farmers’ Markets.The availability of flavours and types however are subject to change from week to week, depending on what ingredients are in season. We also supply wholesale pasta to restaurants and grocery stores. If you are interested in our wholesale pasta, please feel free to contact us and we would gladly give you a list of current pasta flavours and types available for the week. Fill out this form to inquire about our fresh ravioli, and one of our artisan enthusiasts will get back to you as soon as possible.